Amidst the fraught and chaotic scene which is modern day Iraqi football, the youth set up within the country is churning out some real continental gems. Three years on from their record breaking fourth place finish at the Under 20 World Cup in Turkey, Iraq are back again flying the flag on the international stage at this summer’s Rio Olympics, with high hopes of repairing some of the reputation lost by the seniors in the last couple of years. Much of the disappointment (at least on the pitch) with the senior national team has come at a time when the young “golden generation” has been groomed in the country. Ten of the squad travelling to Rio were part of the successful U20 World Cup campaign in Turkey, while the same number was also part of the senior squad that finished Round 2 of World Cup qualification in March. While results have been up and down of late, the sudden explosion of youth talent is set to arrive soon within the senior ranks. 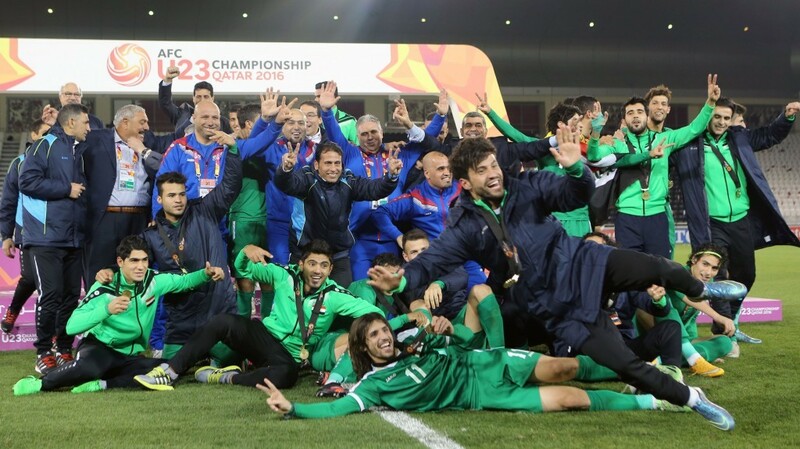 Iraq qualified for Rio somewhat against the odds, with few fancying them to overcome some of the traditional Asian heavyweights ahead of them in January’s AFC U23 Championship. They were initially drawn in the toughest group on paper, going through unbeaten, along the way; recording a victory over a promising Uzbekistan crop and clinching a point against eventual finalists South Korea. Iraq went on to only lose one match, being their semi-final match via a last minute winner for eventual champions Japan. However, they proceeded to become party-poopers beating hosts and many observers’ favourites for Olympic qualification, Qatar, 2-1 after extra time, with both goals coming after the 85 minute mark. Much of the hype around the side that made it through to the semi-finals of the U20 World Cup surrounded left back Ali Adnan, a player that continues to prove pivotal to the Olympic and senior squads to this day. However, since then another defender – Dhurgham Ismail, six months younger than Ali – has taken over the mantle as first choice left back for both sides, moving his partner in crime forward down the left flank. His performances in Australia at the Asian Cup gained rave reviews from across the continent. He’s composed in possession, looks to switch roles with his winger regularly but also has the leg speed to track his attacker back. Already with over 30 caps for his country at senior level, his experience is another ever-improving asset he’s brought to his game. The captain of the side, and likely to be moved centrally from his usual right hand side role due to the absence of Swindon Town centre midfielder Yasir Kasim. Saad Abdul-Amir will be tasked to bring stability and experience to this young and vibrant Iraqi side. With over 50 senior caps to his name, having played every match of Iraq’s current World Cup qualification campaign, Saad is the key pick of the overage call ups. He has the awareness to sniff out danger early, while being a good recycler of the ball in possession while in tight situations. There’s no great deal of fuss about his game but that’s exactly why he’ll excel in this Iraq team. An enigmatic figure who arguably had too much pressure placed on his shoulders at too young an age. Initially seen as Younis Mahmoud’s eventual successor, in the first couple of years he only showed glimmers of what talent he could bring to a nation that continues to struggle in bringing through quality centre forwards. Hyped ahead of the U20 World Cup, Mohannad – who played out that tournament more as a second striker – only scored one in six in Turkey, before dipping in and out of the national team without success over the next couple of years. It wasn’t until this year, when he scored twice in Qatar at the U23 championships (including the equaliser in the effective Olympic playoff), before hitting the crucial winner against Vietnam in Iraq’s last WCQ, where the striker finally started showing what talent he really has in front of goal. He’s a physical player who has definitely come on in terms of goals in the last year. He’ll look to put the pressure behind him and live up to his mentor Younis at the Olympics. As has been discussed many times on this site, the expectation from within the country makes managing any Iraqi national side problematic. Even more so when you consider the ongoing controversies that continue to plague the team off the field, including FA involvement, outspoken former players and division between those plying their trade locally and those who have moved to Europe/North America. Head coach Abdul Ghani Shahad has plenty to deal with. Saying that, the same behind the scenes politics were again on show when Shahad began selecting the overage players for Brazil. In the end an exclusion of their most talented ball player in Yaser Kasim over disciplinary issues, could change the way Iraq use the ball at the tournament. Saad Abdul-Amir is a decent player to have, in both an attacking and defensive sense, but a lot will be expected of him to knit the centre of the pitch together. Instead the more logical game-plan is to look out wide, with Humam Tariq on the right and a combination of Dhurgham Ismail and Ali Adnan on the left to provide pace and intent from the flanks. The key area of strength, or conversely a possible negative, is squad harmony. Get this right and it could be a success, see recent Asian Cup and U20 World Cup successes, but a bad tempered camp could have the opposite effect, see recent Gulf Cup and WCQ campaigns. Poignantly, this squad is devoid of the main protagonists of such drama, namely Younis Mahmoud, Yaser Kasim and Justin Meram. Ali Adnan is prone to the odd outburst, but has been far more muted of late. This camp’s been together training ahead of the Olympics for over a month now, playing a range of sides from local Spanish teams, to former Russian champions and most recently potential opponents in Brazil, including a 1-0 victory over South Korea last week. This side is as prepared as they can be, with a squad of players with experience few sides in the tournament can match. Again it comes down to the mood in the camp, which is regularly on a knife edge. This won’t be truly assessed until deep into the group stage, bur on its day, this side can for sure make Asia proud.